Ignore how yinky the zipper is; I finally figured out how to sew it so the lining and the outer fabric are well away from the zipper so they don't get caught in the teeth. The lining here is Procare, a waterproof polyurethane-lined fabric. 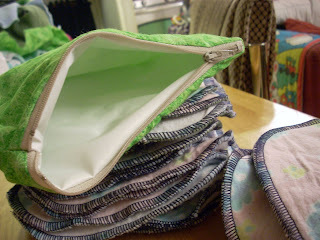 The pouch isn't truly waterproof because the procare lining is cut and stitched together at the sides and bottom. You couldn't fill it with water because it would just leak out, but I'm sure it'll do a fine job of holding some damp wipees for travelling purposes! Next up: a full-sized wetbag to hold icky diapers. Everything was amazing and I vowed to keep my big stupid mouth shut and not complain about a thing, for a change. And it worked. It may have sounded ridiculously effusive, but after a day of Freecycle errands, Value Village and whatnot, I felt like the luckiest person in the universe to have dinner set before me so regally. All I had to do was show up at the table. How many people in the world are going to do that for you, ever??? Where's the "gratitude" smiley?